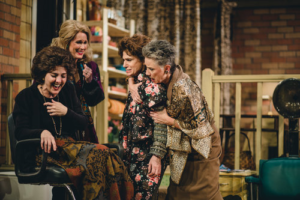 Robert Harling’s comedy/drama play Steel Magnolias premiered off-Broadway in 1987 and ran for over 1,100 performances. 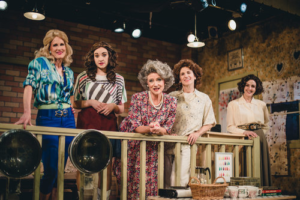 A production at the Pasadena Playhouse in 1988, which starred Barbara Rush and Carole Cook, generated a National Tour that played San Francisco, Chicago, D.C. and other cities before returning to Los Angeles. By the end of the tour the 1989 film version with the all-star cast of Sally Field, Julia Roberts, Dolly Parton, Olympia Dukakis, Shirley MacLaine and Daryl Hannah was in the can and ready for release. 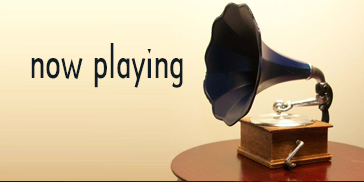 It proved to be a popular hit, grossing over $95 million and garnering Julia Roberts her first Oscar nomination. This writer was never a big fan of the film, feeling the addition of men to the cast and the overplaying of some of the ladies diluted the script’s comic and dramatic impact. 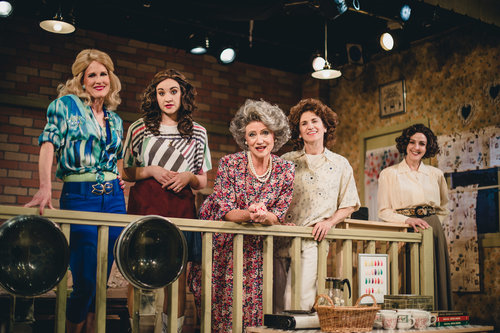 Harling’s concept of six Southern women bonding over the joys and trials of life in a small town beauty parlor works best in its original form. There have been many local productions over the years including one in La Mirada starring Cathy Rigby that later played The Welk in Escondido as well as a production that started at the Rubicon Theatre in Ventura headlined by Stephanie Zimbalist that later played the Laguna Playhouse while adding Teri Ralston to the cast. Actors Co-Op in Hollywood is currently presenting a solid production on the stage of the David Schall Theatre. Director Cameron Watson has assembled a talented sextette of women and deftly guided them through the laughs and the tears of Harling’s tale. It’s amazing to hear so many iconic lines and realize that they first engendered laughs in this play. Harling’s first writing effort was a delicate blend of comedy and tragedy as it told the story of a young diabetic woman wanting one special moment rather than a lifetime of normal. The action all takes place in the converted carport belonging to Truvy, a hair stylist whose business mantra is “there is no such thing as natural beauty”. Stephen Gifford has designed a lovely two-level beauty parlor for the ladies to play upon. 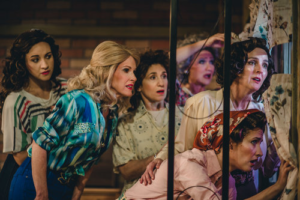 Terri A. Lewis has designed some wonderful costumes for these ladies to wear as proud plumage. Through the course of the play’s four scenes we follow the life of Shelby, starting on her wedding day and the three years following as she gives birth to a son while endangering her life, necessitating the need for dialysis and eventually a kidney transplant. Her mother and her mother’s friends form a loving support group. 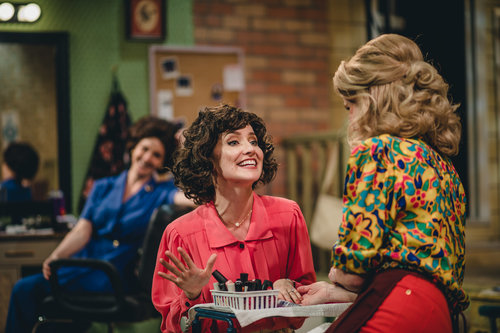 Watson’s top quality ensemble is headed by Nan McNamara as Truvy, the always ready to help hair stylist who takes a young newcomer to town under her wing as her assistant. Heidi Palomino effortlessly shows the various stages of Annelle’s growth from shy stranger to party girl to born again Christian crusader. Treva Tegtmeier gets to do a lot of the heavy lifting as M’Lynn, Shelby’s protective and caring mother, and she does it without breaking a sweat. Ivy Beech makes a lovely and lively Shelby who dazzles in an array of pink outfits. Adding to the merriment is Deborah Marlowe as Ouiser, the neighborhood curmudgeon who’s been in a bad mood for 40 years. Lori Berg shines brightly as Clairee, the wife of the recently deceased mayor who learns to be her own strong woman. These six lovely “magnolias” show they have the steel needed to weather any storm.